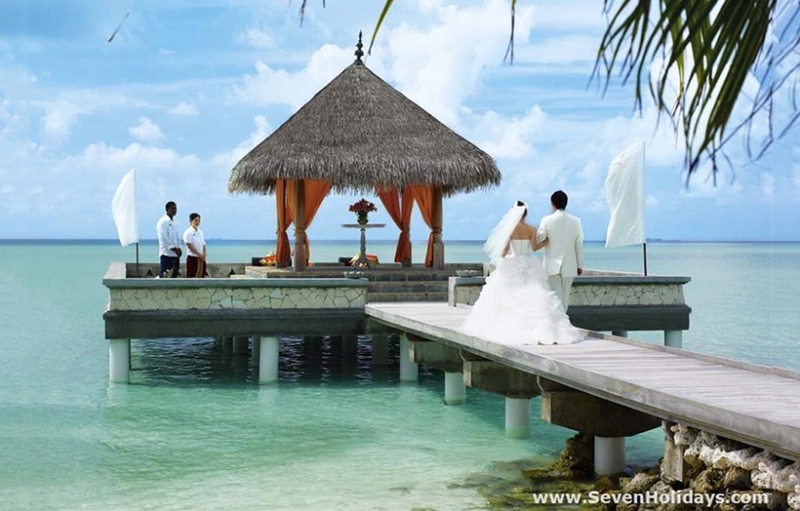 Taj Exotica is unquestionably in the top bracket of Maldives resorts. Yet even this elite group is getting crowded and it makes sense to have unique selling points that your resort does better than anyone else. 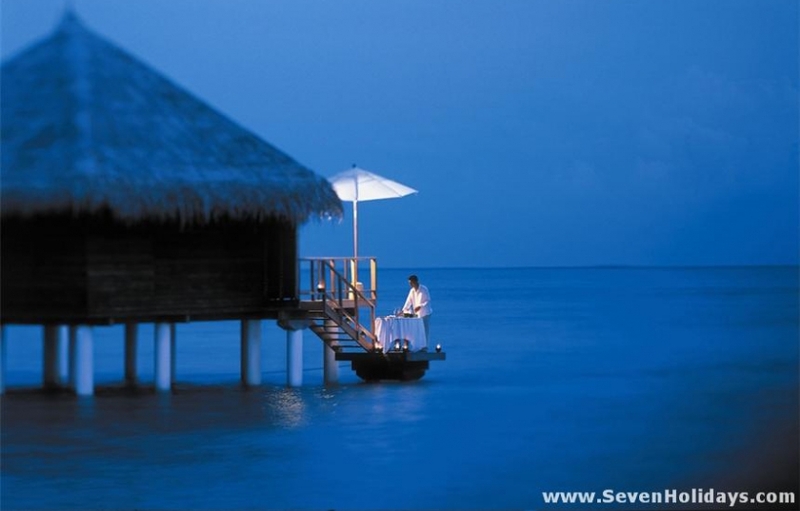 Here, the truly sublime aspects of Taj Exotica are the haute cuisine and the spa. Individually in the top 3 or 4 in the country, they make a compelling case to fly half the way around the world. Another selling point, although not quite unique, is that the resort is merely 15 minutes by luxury speedboat from the airport. 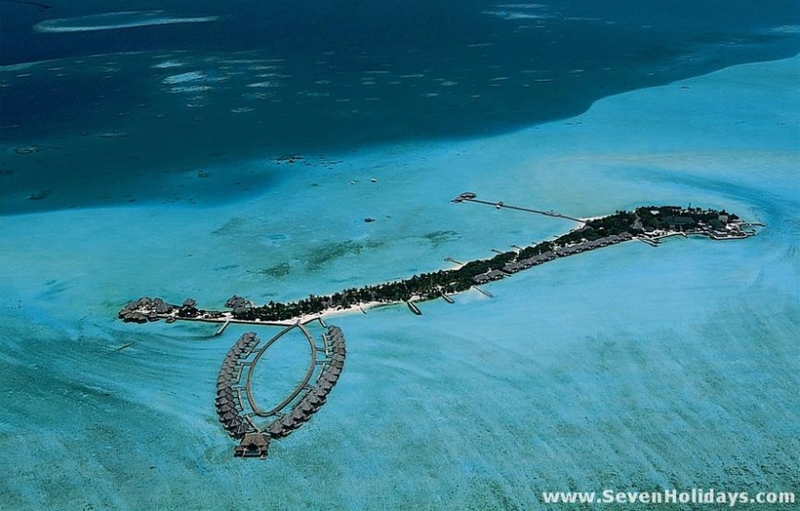 This proximity also enables a special seaplane excursion, as well as easy access to Male for the historical tour. Big game fishing can be arranged but in the main excursions are private sunset or starlight cruises, for Exotica is essentially a slow, calm place where romantic couples glide around in their own space. The huge, shallow lagoon shines out a shade of turquoise that is at once uplifting and calming. Set in the middle of this vast seascape is the thread of sand and vegetation that is the island. So narrow is it that one can often see water on both sides when walking along the path. At the southern tip is the spa, near the speciality restaurant Deep End and the swimming pool. The land rooms, bar, reception and main restaurant, 24 Degrees, all look west to the sunset. Along the east side are the library and waterbungalows. The library is one of the best in the country, with large, expensive, fascinating editions. 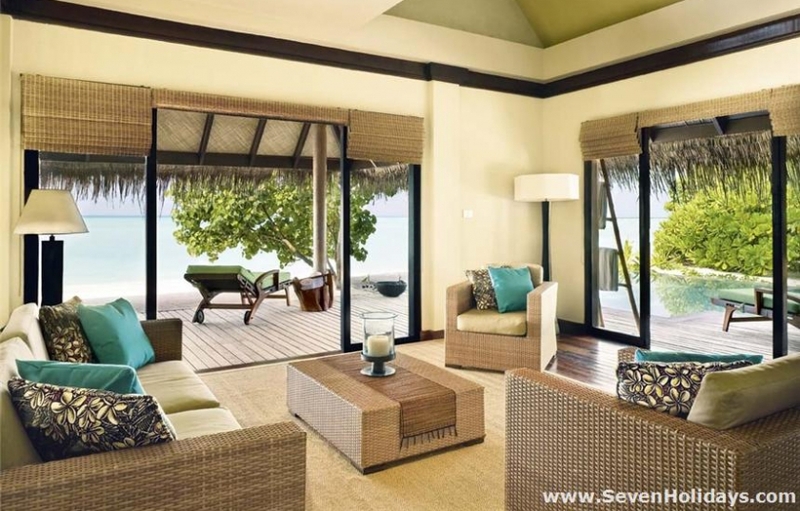 There are 56 waterbungalows: 24 Lagoon Villas, 21 Deluxe Lagoon Villas, 10 Deluxe Lagoon Villas with plunge pool and 1 Presidential Rehendhi Suite. They vary in size and detail but share the same design. The style is rich and refined but not overstated. The warm natural tones of the fabrics and walls offset the formality of the teak furniture and decor. 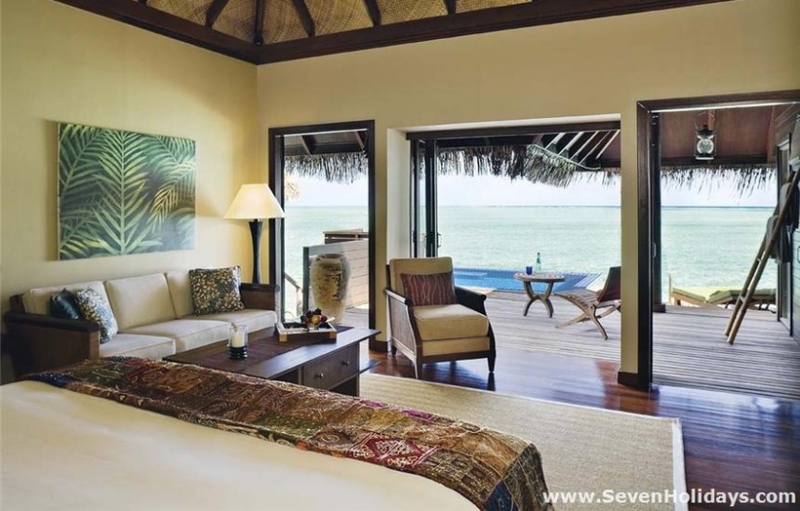 The first of the Lagoon Villas have the hum and part-view of the service area, and a number of the Deluxe Lagoon Villas have the lights of Male on the horizon, but otherwise the views are unbounded. The 8 land rooms have the luxury of extra space, outdoor shade and an over-sized plunge pool with decking on 3 sides and the beach on the other. The path down the centre of the island runs behind the rooms though guests can also stroll along the beach in front. 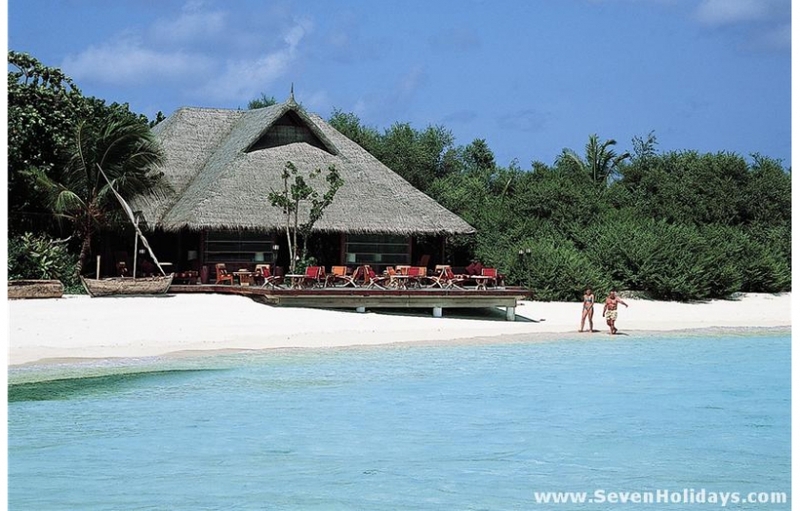 The beach itself is broad, white and slopes imperceptibly into the lovely lagoon. 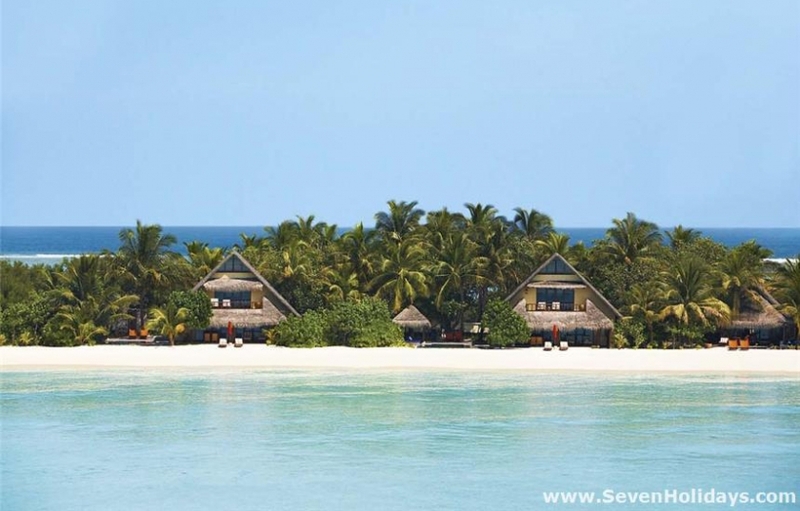 Beach connoisseurs would note it is not the very softest Maldives can offer. Jiva Grande Spa is the premium spa of the Taj Group. As such it has a thoroughgoing, Indian-based philosophy with integrated treatments, exercises and diets. The ayurvedic doctor offers recommendations, which may be strictly ayurvedic for specific conditions or focused on relaxation, cleansing and beauty. Yoga and meditation are taught in the glass-walled gym over the water, just outside the spa, which looks great - under thatch by the sea, surrounding a floral courtyard. 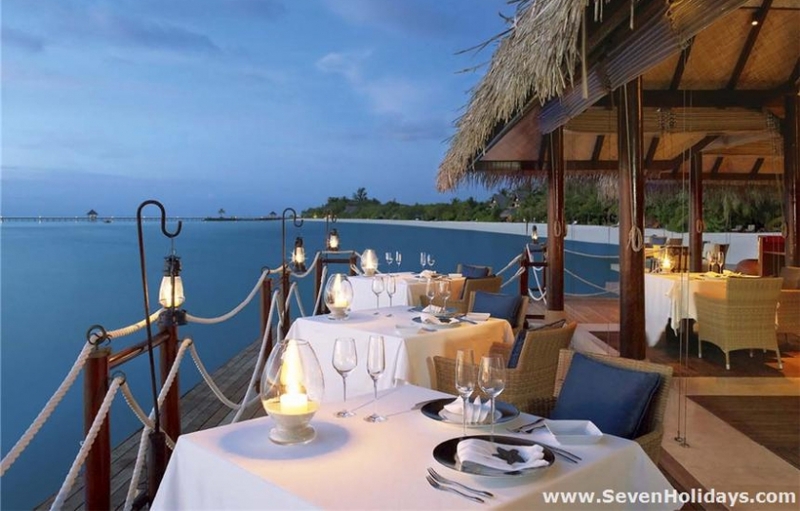 The Deep End restaurant serves ‘progressive world cuisine’ in a delightful, partially al fresco setting over the sea. It is the only restaurant in the country that has been featured in Condé Nast ‘Hot Tables’. 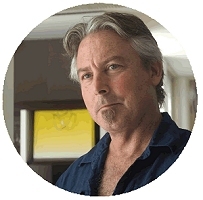 The resort’s sommelier has a large list to draw on for his recommendations and also leads guests in specially arranged Wine Trails around the world. All daily meals at Deep End are à la carte. 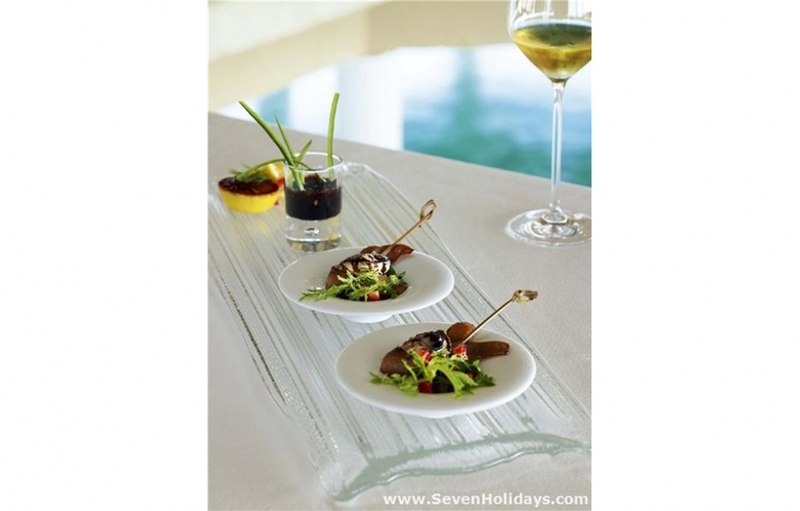 For presentation and freshness the single plate precisely prepared by the chef is the only way. Or, if you have a dietary preference, the chefs will be happy to take care of it. The options are limitless. If you wish a complicated lobster menu for dinner, just mention it at lunchtime. At the 24 Degrees restaurant dinner is a themed buffet for 5 nights a week. 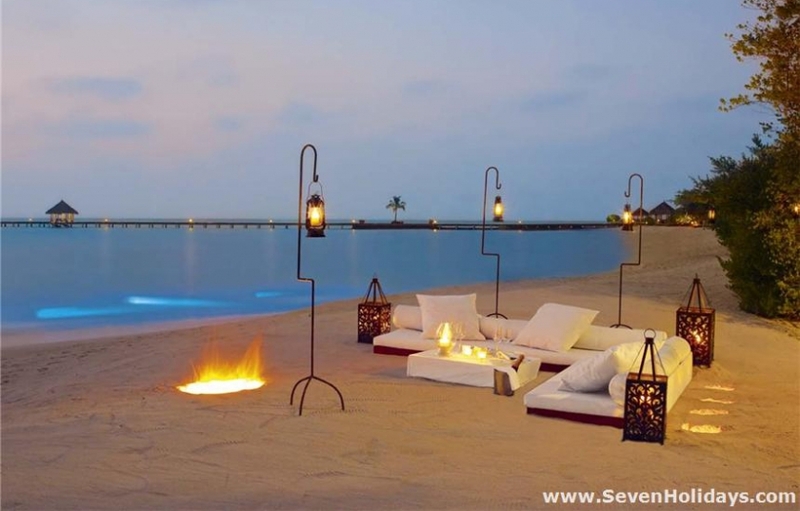 These are Seafood and Maldivian Grill, Indian, Asian, Barbecue and Taste of Maldives & Indian Ocean. 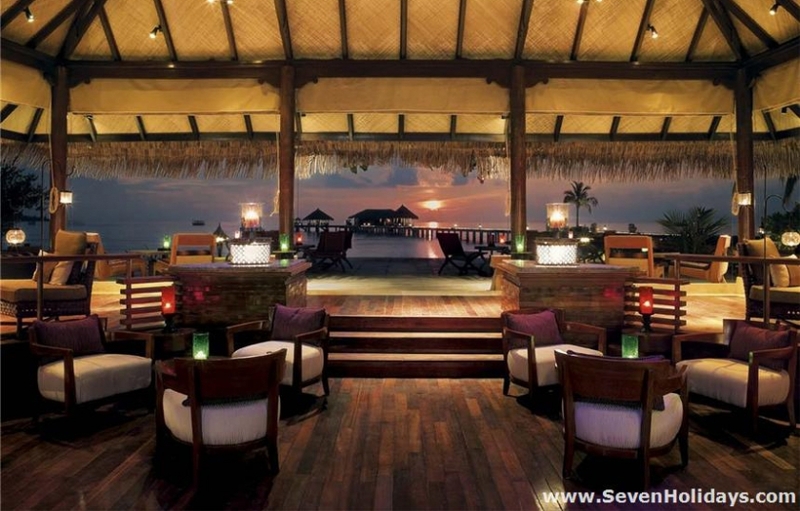 The Equator Bar is one of the best looking in the country. Its cocktail menu is as varied, inventive and thoughtful as any cuisine menu. Unfortunately the massive, shallow lagoon means that there is no snorkeling of note in the lagoon and no access from the beach to the reef edge. There is a ferry to a pontoon near the reef edge but it is much better to get away to another reef for quality snorkeling. Yet it is in the nature of this resort that guests don’t seem to miss the snorkeling nor concern themselves with diving . 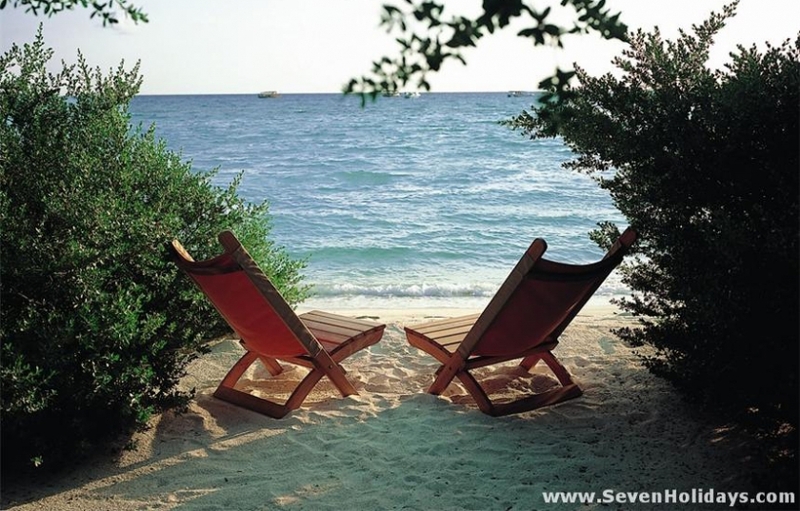 This is truly a place for lovers and honeymooners. 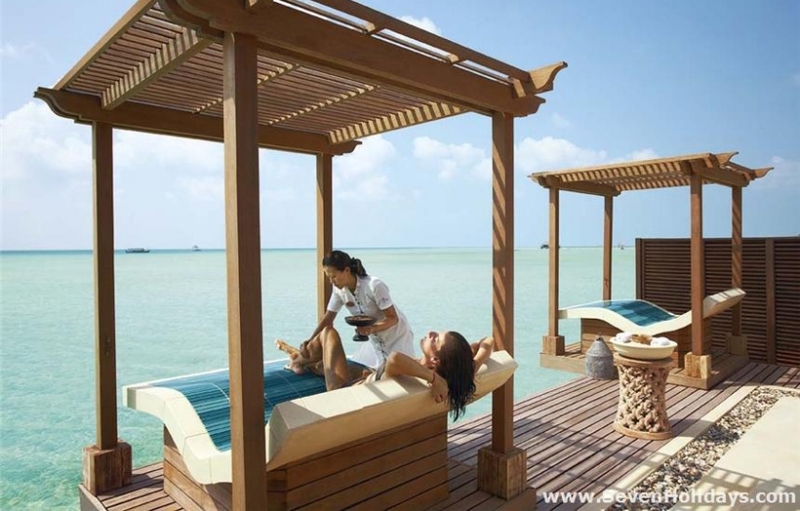 For the sensual pleasures of the body and the mind, Taj Exotica is the place to come.